The service chronicles listed below were published in the Spring 2019 issue of the KEMSA Chronicle magazine. If you would like to submit news from your service for publication in the magazine and on this website, view information about submitting your news here. Director Chad Pore resigned his position with BCEMS effective February 1. Director Pore accepted a position with Med-Trans as a Program Director where he will be based from home. BCEMS has made great strides in the last five years under the leadership of Director Pore. They are certain Director Pore will be successful in his new endeavor and wish his family and him well. BCEMS would also like to welcome new Director, Frank Williams, to the family. Frank has a long history in Butler County as it is the place he started his career and the place he lives. He has continued running the Butler County Rescue Squad and for almost the last 20 years has been an integral part of LifeSave. BCEMS is excited about Frank coming on board to continue leading the agency forward. JCCC is pleased to announce the launch of the EMS Research Collaborative, a group composed of JCCC faculty and local EMS providers, to generate original research for publication. 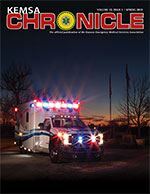 Many EMS providers have not had access to a research IRB; therefore, this partnership hopes to remove barriers that may have prevented organizations from publishing EMS research. The JCCC EMS Simulation Center has just completed an expansion and upgrade process. The upgrade replaced all the existing analog cameras with digital pan, tilt, zoom (PTZ) cameras, and the Learning Space software suite. The expansion adds two additional flexible space rooms to the existing Sim apartment and ambulance allowing for up to four simultaneous simulations. Scott Craig, Associate Professor of EMS, has also completed both the Laerdal and Gaumard simulator repair technician training programs. Leavenworth County EMS experienced some staffing changes over the last month. The service is pleased to announce, Lieutenant Christina Johnson was promoted to the rank of a Shift Captain and paramedic Courtney Simanowitz was promoted to the rank of lieutenant. With these changes, two paramedic positions within the service were backfilled with paramedics Joseph Thompson and Adam Yankech. These staffing changes have placed the service back to full staffing. On Jan. 28, MED-ACT welcomed a new academy class of paramedics, marking the start of their 44th year in service. A total of seven new hires, ranging in backgrounds and experience were hired on as the first class of 2019. Their service began with a full week of introductory information, skills verifications, and training. They will continue through their first year stage program with their assigned Captain partners, and we look forward to watching them grow in our department. On Feb. 5, MED-ACT began utilizing the ESO program for their new electronic medical records system. This next step in technology will help comply with the NEMSIS 3.0 requirement and significantly enhance clinical data reporting to assist in quality improvement efforts across the county. The new program has the capability to interface with fire reporting systems to simplify QA and for a health data exchange with area hospitals. Reno County EMS has been working hard these past months to kick off a new peer support program. Thanks to Nathanael Hawkinson for heading this committee, doing the research and presentations, as well as bringing in the experts for training. Nate is joined on the peer support committee by Rebecca Mendoza, Emily Salmans, Kyler Jones, and Jeremy Courtney. RCEMS looks forward to having this very necessary resource available to staff members. RCEMS congratulations new hires: paramedics Delany Curry, Brieaun Baier, and Joshua Creer. Reno County EMS was also the recipient of a FireHouse Subs grant to provide the service with extrication gear. This gear will ensure that RCEMS staff are able to become more active in the extrication process while being properly protected. This spring, RCEMS will be sending out one of their fleet for remount with AEV as well as installing the Stryker Powerload system in all first out units. In 2018, Wesley presented it first ever DAISY award to a large team of people. Trauma survivor Ian Barnett and his mother were there for the ceremony to recognize the amazing care team that saved his life after a horrific crush injury. Last summer Ian was working a job spraying weeds with a boom from a truck in Butler County when the truck was hit by another vehicle. He sustained a severe, life-threatening chest injury. Butler County EMS was the first to arrive on the scene and called EagleMed for transport to Wesley. Wesley’s trauma team worked feverishly to save the young man’s life. Wesley medical providers knew Ian’s situation was grave and called for ECMO (extracorporeal membrane oxygenation), a treatment that uses a pump to circulate blood through an artificial lung back into the bloodstream of a patient. This system provides heart-lung bypass support outside of the body. Wesley provided the initial, much needed ECMO treatment before transporting Ian to INTEGRIS Health in Oklahoma City for further care. Once treatment at INTEGRIS was completed, Ian returned to Wesley, and after many months, has completely recovered. A team of more than 40 people touched Ian’s life and Wesley recognized them with the DAISY Award – in-house recognition for excellence in care. Doctors, nurses, directors, managers, respiratory therapists, lab techs, Butler EMS, and the EagleMed pilot were all honored at the ceremony.